Surgery is never a fun topic — especially when it has to do with your pet. Thankfully, healthy CH cats can receive anesthesia without an issue, but your cat isn’t necessarily out of the woods once the surgery is over. There are a host of things to take into account post-surgery to make sure your cat’s recovery goes as smoothly as possible. Speak to your vet before the surgery to make sure your pet’s surgeon and staff are all aware that your cat has cerebellar hypoplasia. This is your last chance to make sure your cat’s condition and comfort will be taken into account directly after the procedure. During this time, bring up recovery concerns — specifically that your CH cat may be additionally uncoordinated as he recovers from anesthesia, which can lead to pulled stitches, injury and more. Ask if there will be someone present to monitor your cat post-surgery, and if they can do anything to help prevent injuries like add extra towels or padding to your cat’s recovery cage. Ask about expected recovery time, and when you’ll be allowed to bring your cat home. If your cat is to be kept overnight, ask if someone will be there the entire time. Sheila opted to have her CH cat Buster’s surgery at an animal hospital, instead of her local vet, because the hospital provided 24-hour care. At this time you will also be told if your cat can’t have any food or water prior to surgery. Make a note of this, and be sure that you and your cat stick to it. 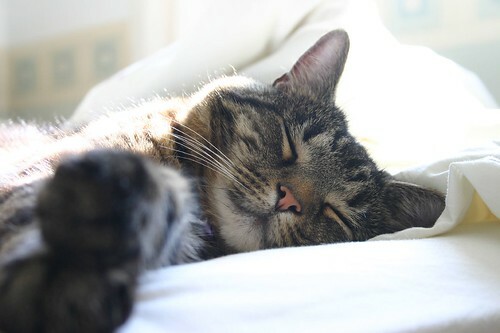 Before you go to pick up your cat post-surgery, prepare a room (a guest bedroom, for example) for your cat. You’ll want it to be private and quiet. Place your cat’s food, water, litter box and bed in this room. By providing your recuperating cat with his own essentials, you can easily monitor how much he’s eating, and if he’s using the litter box. Prepare the room before you bring your cat home; you certainly don’t want him waiting in his carrier as you pull everything together. Speak with your vet to see how the procedure went. 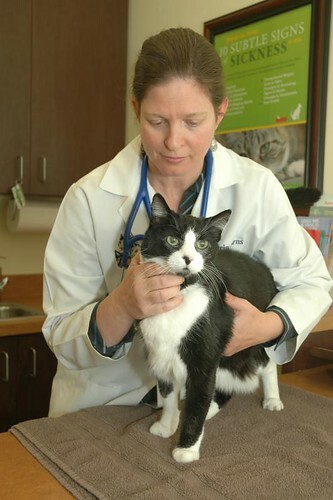 Ask if there were any complications or any concerns while your cat was recovering. Your vet should go over any medications or other instructions at this time. You’ll need to know which to give when, how to administer them, how frequently (times per day and for how many days), what to do if you miss a dose and possible side effects. Write them down, as you may feel a bit stressed and distracted, which could impact how well you remember them. If you have concerns about administering medication or changing dressing, bring up those concerns and ask for suggestions at this time. Once you bring your cat home, take him to his quiet room. If he’s extra wobbly from the anesthesia, you may want to limit him to the floor. Spend some time petting him and speaking to him gently. Visit him occasionally to see how he’s doing, and always keep the door closed. He will smell different, which may intrigue or frighten your other cats. Again, watch how much he’s eating and using the litter pan. It’s also a good idea to watch how he’s treating his stitches or wound. It’s OK if your cat begins to bathe himself, but you don’t want him nibbling at an incision point, the stitches or other bandage. (If he does, your vet should be able to give you an E-collar.) Carefully watch the point of incession for redness, swelling or discharge. Call your vet if you see any of these. Similarly, you’ll want to make sure he isn’t too active. Too much activity can irritate or open stitches. This is especially a concern if your cat is still recovering from the anesthesia or pain killers. You certainly don’t want your cat tumbling wildly around your home right after surgery! Encourage your cat to chill out by resting with him or allowing him settle down in his quiet room alone. He may need to take a few days to get back into the swing of things — give him as much time as he needs and forgive any temporary behavior changes. Yes, all of these suggestions may help, but at the end of the day, you know your cat best. When we brought Ellie home after her same-day spay, she was so rambunctious and extra-uncoordinated (because of the anesthetic and other pain killers) that she was truly a danger to herself. However, we quickly learned that confining to a bedroom by herself her wasn’t the right solution, as she would wail and fling herself into the bedroom door in protest. So, we let her out and tried to have a quiet evening. It took her a while to quiet down, but at least we were around to monitor her — and prevent her from climbing the couch! Has your cat ever had a surgery? What was your experience? Do you have any other suggestions to add? Please share in the comments!